You'll be £25.00 closer to your next £10.00 credit when you purchase The Disastrous Fall and Triumphant Rise of the Fleet Air Arm from 1912 to 1945. What's this? In this riveting critique of the Fleet Air Arm's policy across two world wars, former FAA Fighter Pilot Henry Adlam charts the course of its history from 1912 to 1945, logging the various milestones, mistakes and successes that characterised the service history of the Fleet Air Arm. Offering criticism on the service hierarchies that made up the Fleet, backed up by his having served in six Carriers and flown from them in all five theatres of sea warfare during five years of the Second World War, Adlam presents a highly entertaining and potentially controversial study which is sure to appeal to a wide array of aviation enthusiasts. Adlam charts the catalogue of errors that blighted the history of the Naval Air Service, which followed the disastrous decision in April 1918 to transfer the whole of the Air Service of the Royal Navy to form the new RAF. The main and over-riding criticism that the author finds with the Fleet Air Arm lies in the manner in which it was led. Adapting the oft-quoted "Lions led by Donkeys" description of the British Army, Adlam describes the activities of the Fleet Air Arm in the Second World War as the result of "Sea Eagles led by Penguins" practices, when experienced pilots were led into battle by senior members of the Navy who possessed little or no flying experience. This led to a whole host of disasters costing many lives amongst flight personnel. 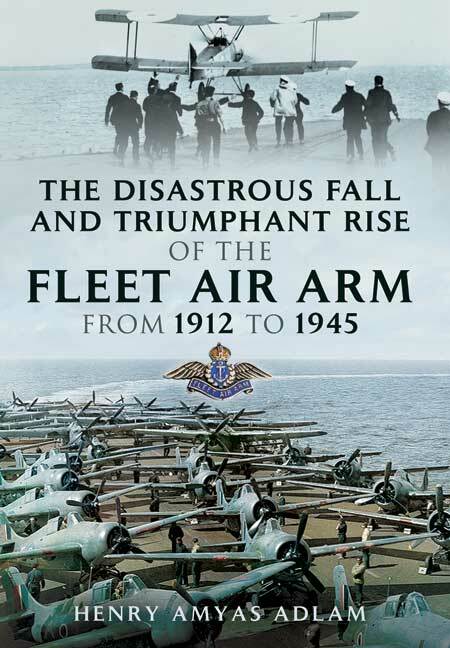 Adlam charts the errors that blighted the history of the Fleet Air Arm and shows how its recovery and the triumphant turnaround of its fortunes were all the more remarkable. Taking the reader on a journey from inception during First World War service, throughout all the many disasters and successes that followed between the Wars and on into the Second World War and beyond, this book offers engaging new insights and a degree of critical candour that set it apart from other Fleet Air Arm histories currently available on the market. The author is at his best when putting readers in the cockpit of a Hellcat or Corsair on hair-raising ‘ramrod’ missions, or in cogently describing the complexities of task-force operations. As well, he offers ever-relevant, sympathetic insight into the insidious problem of what is now termed PTSD. Evocative illustrations from Adlam’s own painterly hand would, themselves, make the volume worth its reasonable price. A very open hearted report of a battle by which of the British and their Commonwealth-comrades may be said that they followed up to the letter the words of war leader Churchill ‘we shall not give up’. A recommendation for interested in aircraft carrier flight history. This book offers a different perspective and is therefore a useful addition to the bookshelf...A very interesting read which provides a personal insight from "one who was there". This book should be widely read because it lays out the inspiring story of how the British naval aviators have bounced back each time they have been let down by the politicians and how they have rallied in the face of significant odds in time of war, performing far beyond any reasonable expectations. As seen in the Ross Gazette.